Hi ya’ll! I’ve been taking and editing about 75-100 photos per night for Vacation Bible School this week! Not a lot of new recipes going on, but here is…. 1. You can double the Whole Grain Chia Waffle recipe. It does great! I add an extra 1/4 cup of milk because the batter is a little on the thick side. 2. You can use a whole pound of Italian Sausage or Italian Turkey Sausage instead of 1/2 beef and 1/2 sausage in the Tortellini with Italian Sausage. 3. Making a Taco Braid is fun. But using Whole Wheat Pizza Crust instead of the regular Pizza Dough is not as tasty. I love Whole Wheat Pizza Dough… but not with taco meat. In addition, I wanted to include how we save $3800 per year. I know there are a LOT of lists out there. I tried to keep this practical and thought-provoking and hopefully something new. Now my daughter’s hair needs cut only every 12 weeks or so. That’s $40. For guys, it is relatively easy to cut hair. Use the right clipper guide for his hair (we like 1/2″ guide for overall and 1 and 1/2″ for the front). The instructional video is now on Youtube as well. For girls, it isn’t so easy. But wait! There’s YouTube! In this 6 minute video, my daughter and I figured out how to cut her hair. Nothing fancy, but it’s what she wanted. I can’t cut my own hair. If you need a cheap place to get a haircut, locate a salon school nearby. Our salon school charges $6 for a haircut. Charter would LOVE to sell us cable and a telephone line. We played that game before – hook us in with a great intro rate and then after 12-18 months we are way in over our heads! Our family watches a handful of shows which are almost all on Netflix or Hulu. I signed up for their free trials. I put the “Cut off” date for the trial on my calendar to alert me that my trial would end. But, instead we let it go and kept them both and cut off cable. I do miss watching “Elementary” and the “Food Network”…. Sometimes. But we DO get to watch: all the seasons of “Merlin” (I can’t believe it ended! ), “The Good Wife”, “Castle”, “Once Upon a Time”, “Agent Carter”, “Marvel: Agents of Shield”, “Frasier”, “Third Rock from the Sun” and many others. Amazon Prime has movies and TV shows as well. But it doesn’t work with Chromecast since they have their own “Amazon Firestick”. It might work for you though. Or we could just get the stupid stick. OR Amazon could change it so I can Chromecast without buying their stick! Ha! Back when I had a full time job at Citibank, I was one of those weird people who listed to the afternoon radio talk shows. Here in St. Louis it was always about how to save money. Or in other words – the best way to use the money you have. US Bank and many others have a savings account and/or money market account rate set for .05%. It used to be higher before the recession. But for now, it is .05%. You could get a tiny bit higher if you lock your money in a CD or deposit over $1,000,000 into a savings account that would earn .05% more and that would be silly. At this rate, $1000 in a money market account would earn you 50 cents…..for the ENTIRE year. Putting that same amount into a mutual fund at Vanguard could earn $63 per year. (Assuming that the rates are going to be about the same… the past year earnings have been as high as 9%, but the lowest I have seen is 6.3% so I’m using that number). Now #1: this is money invested. No future guarantees of course. But since the stock market will more than likely be higher in 10 or 20 years (we hope) then it is a better return. Actually with inflation, money sitting in a 0 or .05% account is losing money because of inflation. The best way to save is not to spend your money. True. But letting it sit also causes you to lose money through inflation depreciation. #2: This is only money that you have AFTER you have an emergency fund in a liquid account like those savings and money market accounts that don’t make any money. In case something were to happen, an emergency fund is necessary and Dave Ramsey gives a great “baby steps” outline on how to get there and why. Fees can destroy your return. Why do I have a Vanguard account? I taught public school for two years and therefore had money in a 403B retirement account. It’s like a 401K in the private sector. When I quit teaching, I wanted the money to earn a better interest rate somewhere with low overheard fees. So hence why I did all this research. No, we don’t have tons of money. I wish! I think I might spend more than average at the grocery store, but we started eating out a LOT less. Gas money saved, time saved, healthier eating and just better food over all. For our family of 4, eating at a fast food restaurant costs about $25 per meal. Do that once a week and you have $1300 per year. Eating at a sit down restaurant costs about $40 per meal – Do this once a month- at about $480 per year. 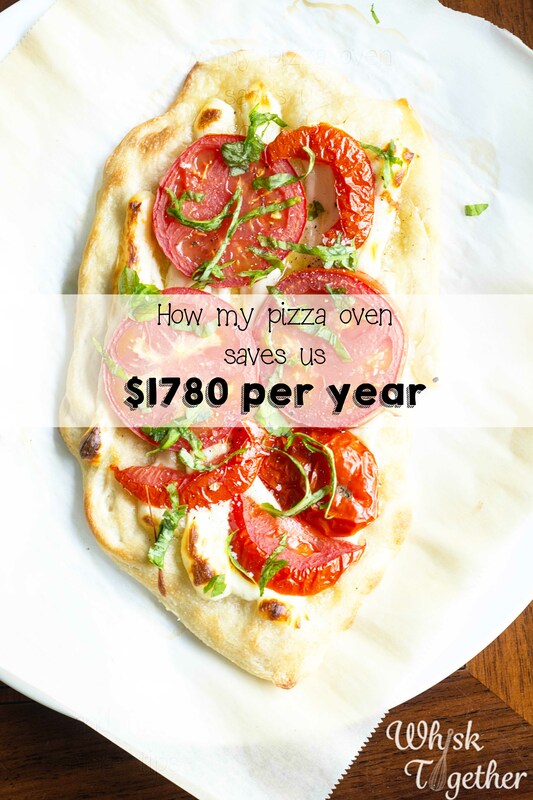 A few years ago, I purchased a toaster convection oven. What prompted me? It was 115 degree heat index here in St. Louis for almost 2 months and over 90 degrees for 3 months. Too hot to grill and too hot to turn on the oven. I use the toaster oven every single day to toast bread, broil 4 grilled cheese sandwiches at once, bake pizza, roast vegetables, bake oatmeal, keep meals warm, bake appetizers, extra oven space during the holidays, and reheat leftovers so they are crispy and not soggy. Eating leftovers is super frugal. But sometimes they are not very good out of a microwave and 2 extra minutes in the toaster oven turns a cold, soggy pizza into a crisp, fresh slice of pie. I know it was a little money to buy it in the first place, but avoiding eating out several times a year over the past five years as saved us ten times what it cost. Where do we shop for food? 1. Aldi: produce, butter, cheese, cream cheese, raisins, peanut butter, canned tomatoes, canned pumpkin. 2. Trader Joe’s: dried fruit, nuts, tea, seasonings, chips, cage free eggs, milk, mascarpone cheese, baking powder, cookies, chocolate, frozen fruit and vegetables, lasagna, turkey corn dogs, white whole wheat flour, and the kids get a treat for finding the stuffed animal in the store. 3. Costco: fruit and nut bars, yogurt, meat, fish, frozen wild blueberries, fresh spinach, cinnamon, vanilla extract, cocoa powder, lemon juice, olive oil, strawberries in season. None of these places take coupons I know. But after kid #1 got sick and almost ended up at the doctor’s office because of a “freebie” I found while clipping coupons, I stopped clipping them and started shopping at other stores. Our local YMCA charges $70 per month for a family membership ($70 x 12 months). This does include childcare and all kinds of cool things. People have different goals. People need the motivation of a gym membership and I get that. Being a healthy weight will save time and money in the long run as well. One of the commenters on my blog mentioned “Fitness Blender” workout videos, and I have been hooked ever since. 2. I like that there is no music. 3. They have a variety of low impact and high impact/challenging workouts. 4. They have a great website where you can put in your desired time, workout level, target area, etc. 5. These workouts really work! I gained 5 pounds this past year, but my clothing size stayed the same. 7. Every video 100% quality and is 100% FREE. I’m not saying Jillian Michaels does not work. I still love those workouts. But after 3 years of the same one, it is nice to pull from a different variety. 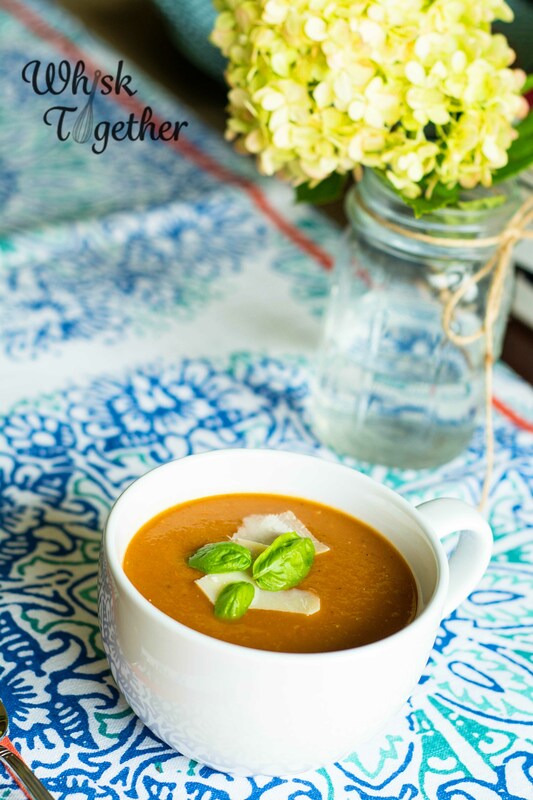 This soup is PERFECT for this time of year! Tons of tomatoes and basil are at hand and ready for picking right now. 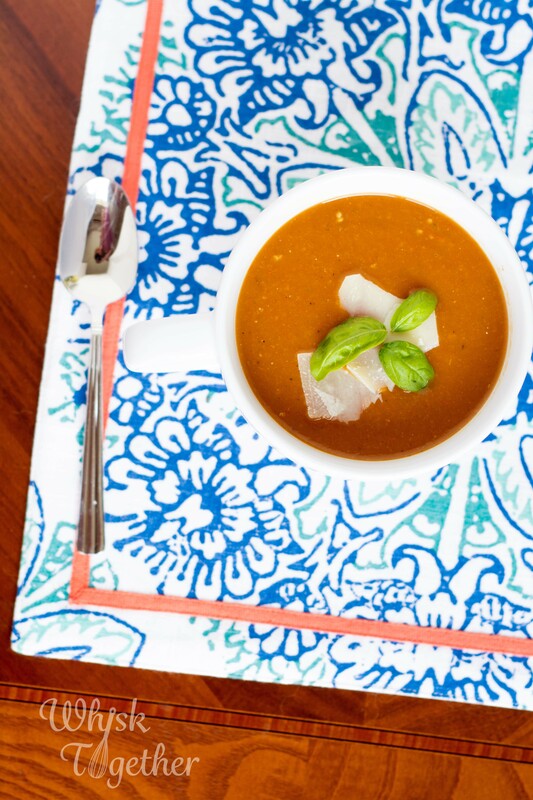 Not in the mood for hot soup in the summer? No problem! Cool to room temperature and freeze until winter. Preheat oven to 400 degrees. Line 2 rimmed cookie sheets with parchment or foil. Spray with olive oil cooking spray. Lay the tomatoes cut side up on the sheet. Spray with more olive oil cooking spray. Sprinkle with salt and roast for 40-45 minutes. In a large pot or Dutch oven, heat the butter over medium heat. Add chopped onions. Cook until translucent and turning brown – about 10 minutes. Add garlic. and cook 30 seconds. Add the rest of the ingredients: canned tomatoes, basil, thyme and chicken broth or water. Add the roasted tomatoes with their juices as well. Turn heat to medium high and get the soup up to a boil. Turn heat down to medium or medium low and simmer for 40 minutes. At this point, you can use a blender to puree the soup in batches, or an immersion blender, or a food processor, or a food mill with a coarse blade. Add salt and pepper to taste. I like to sprinkle shaved Parmesan cheese on top. We have Samsung phones, a Samsung tablet, and a Samsung DVR, so we can watch Amazon Prime through one of our devices and view it on the tv since the device and DVR communicate with each other. Haircuts add up so quickly! Just last night, Mr. Crackin’ ventured into cutting Baby Crackin’s hair for the first time. He has cut his hair and the teenager’s hair for years but Baby Crackin’ has always had the special privilege of having his cut by the professionals! At almost 4, he is very squirmy and it wasn’t Mr. Crackin’s finest haircut ever but hopefully this improves over time. That’s awesome! My husband does cut most of his own hair, but I do the children. When they were around age 2 or 3, I did have to plant the television in the bathroom to cut their hair. But still – you can get it cut before you even drive to the professional. Such a time saver with multiple children! I am so with you on cutting the cable cord. We had a satellite dish but got rid of it a couple years ago and we haven’t been happier. We’re not big TV people anyway so we’re totally content with Netflix and Hulu. Thanks for the tip about Vanguard. I found your site through moneysavingmom.com. I always joke that when we win the lottery I will stop cutting hair. We have 4 boys that need monthly haircuts. Yesterday I was fantasizing about not having to cut their hair anymore when I realized that I am easily saving $50 per month by cutting it myself. So now I’m thinking that even if I were rich, I’d still cut their hair! My friend and I were discussing something similar the other day…. if we won the lottery or rich or whatever, would we still… and fill in the blank. I think it started when we found a regular 12×12″ decorative pillow for $90. Even if we could pay for it, would we? Meh, probably not. We love Elementary but don’t have cable/dish either. And of course it’s not on Hulu. So we go online directly to CBS and watch it there. They have the last 5 or 6 episodes. 🙂 Yay! I forgot about that! I used to watch Criminal Minds that way years ago. Our TJs will take coupons. Granted, there isn’t much that could. 🙂 Thd only one I use there regularly are the ones for Applegate Organic hot dogs. I love my toaster oven. I had put one on my Christmas list my sister asks for every year. I figured just a little one, but she got me a good sized one. It is so great in the summer. I can still have meat loaf, homemade pizza, casseroles, etc. Usually we don’t have that as much in the summer because I don’t want to heat up the whole kitchen turning on the oven. I use that toaster oven almost every day. Never thought of making grilled cheese in it. I’ll have to try that. Definitely going to check out Fitness Blender. I don’t have the funds for a gym membership right now, and I don’t always have the time to get there, so prefer working out at home where I can work it easily around my schedule. I had started a couch to 5K program earlier in the summer, but gave up when the weather got over 90 every day. Not doing that. So I’ve been doing video workouts inside and have been looking for something new to shake things up. I hear ya! I can’t walk or run outside over 90 degrees either. Blah! Elementary is now on Hulu! I just started watching it because my friend raved about it. I kept wondering where I knew Sherlock from and then I realized that he was Eli Stone! Yes! They put it on Hulu just last week I think and I have caught up on Season 3. I was wondering if anyone noticed that too!